Let me open with the fact that I think Jessica Olin is awesome. [Editor’s note: I swear I didn’t pay her to say that.] Let me follow up with the additional statement that we have never met in person. Our communication has always been electronic: Twitter and email and via “Letters to a Young Librarian.” Over time, I’d like to think there has grown a mutual respect. So when she put out a call for guest posts, I was quick to reply. Why? Because one of the most precious and amazing things about the internet is the sharing of information, and having the opportunity to “communicate directly with library science graduate students and new professional librarians” is yet another way to do that. You can read about me, my experiences, and expertise in my bio, but the thing I want you to know is that I struggled with what to write about. I’ve a love and interest in history; I work in employment; and I have a disability. Any of these would have worked for a topic. However, in the end, after much thought and scribbling, what I ended up with was a personal love letter to libraries and librarians. Rather than tips or advice on the work and information, I thought it might be best to simply speak from the heart, not as a historian or employment policy expert, or even as a person with a disability…but as a grateful patron. I didn’t have a library growing up on a small island in the Middle East. It wasn’t until seventh grade, when I changed schools, that I discovered what a library was. Before that, knowledge came from the bookstore. In my young mind, that’s where all the books were kept and so I could only gain as much knowledge as I could convince my parents to purchase. Thinking back, I have to laugh at how I badgered them about “Just one more book!” But that first day of walking into the school and into the room that they called the “library” (it really was not very large, perhaps 700 square feet in total), there were so many books, boggled my mind. I could read as many as I wanted. And, best of all, I didn’t have to BUY them. I remember the librarian explaining to me how to check out books and the rather tall stack I left with that first day. I can’t recall what the books were but I can remember a few things from that era of my life. Memories that are very precious to me: pulling Anne McCaffrey’s White Dragon from the shelf and flipping through the pages, since it was the book that started me down the path of reading and eventually writing my own fantastical stories; reading The Andromeda Strain in the brightly lit space and shivering as I realized how it connected the science from my biology class to science in the real world and its potential terrible impacts; I learned how to bowl and ride a horse from books (true story, I learned enough that after my first riding lesson, I was moved to a more advanced class); I studied French and got a taste for astronomy. And all of this with a librarian who laughed at my usual large stacks of books every time I went to check out; who stayed open “just a few minutes more,” who would ask how I liked different books, and always, always had suggestions for even more. This love of the library continued in college. It was my sanctum. Moving from the Middle East and a community and culture I knew, to halfway around the world and a college campus with more than 30,000 students…to say it was culture shock would be an understatement. I went from being a decent enough student who was getting by with adequate grades to one who was struggling with managing my studies, myself, and my vision loss. The library is where I went to hide when the world was too much. It was where I polished my computer skills and really learned how to use a screen-reader to access the world via computer (while my guide dog slept comfortably under the desk). Paper and text were mostly out of my reach but with assistive technology and a little bit of help, I could still access it. This is this point where librarians shine. Where they show how it isn’t just the books and computers that make the space, but the people. [Editor again: This is another thing I didn’t pay or even ask her to say. *big grin*] The staff helped me to find books I needed and retrieved them for me. Occasionally, I’d feel adventurous and attempt it on my own. Trust me, with a visual impairment, reading one letter at a time is not an effective way to try and find a specific book on a specific shelf. But I loved the fact they respected my need to be independent. I graduated, and went on to law school. I didn’t spend as much time in the campus library, but that was because I had moved to the law school’s library. I’m speaking about “my” libraries and the experience of one blind student, but it is an experience that I think occurs in a variety of libraries with patrons with a variety of disabilities. I love books. I love having a time and space to enjoy them. I love the access to text given through computers. I love the cultural events and activities. Libraries provide all this. And not just to those who can afford it, but perhaps most importantly, to those who can’t. It is why librarians are so very important. They set the tone and define the space. Otherwise, it’s just a building full of books. They shape the welcome and use their expertise to actively help people grow and thrive. To this day, I have a fondness for libraries. I love to visit them. I love to browse through the stacks and smell the pages. I love even more perusing their online selections, my iPhone reading off titles to me, and then downloading the latest thriller, or history book, or even romance novel (I never could resist a good happily-ever-after). I love when the librarian eyes my selections and offers suggestions. Libraries have changed with the times, but that key feature, access to knowledge, hasn’t changed. Librarians and their attention to patrons’ interests and desires, hasn’t changed either. And for that I will forever be grateful. 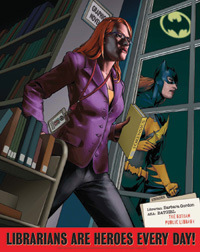 To all librarians and future librarians. Thank you. Day Al-Mohamed is Senior Policy Advisor with the U.S. Department of Labor, heading up the Add Us In initiative. She has also worked as a lobbyist and political analyst on issues relating to healthcare, education, employment, and international development. Follow her on Twitter, @DayAlMohamed and read her stuff all around the web.